Long time no speak, New Haven! I hope everyone has been making the most of summer 2014. With Labor Day Weekend quickly approaching (translation: summer, as we know it, is coming to an end), I thought it would be fun to wrap up with a slideshow created by me and you. Yes, you. ALL of us can participate in the action! The slideshow will be called "Summer in Elm City", and I would love for you to submit your family-friendly New Haven photos so I can add them to our slideshow, to be aired on What's Up New Haven's primary social media outlets (Facebook, Twitter, Instagram, blog) shortly after Labor Day. How to submit photos: E-mail your photos to info@whatsupnewhaven.com or you can always @whatsupnewhaven me on Facebook, Instagram or Twitter. Please submit photos by Monday, September 1st. You are welcome to include your name, a caption for your photo(s), etc., but it is not mandatory. 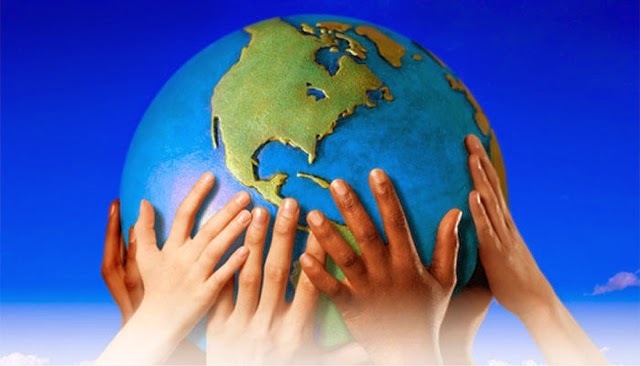 Earth Day 2014 -- Events and Ideas! Happy Earth Day, New Haven! Earth Day this year is April 22nd, 2014. Although we should strive to celebrate Earth Day every day, this designated day is a nice reminder to care for our environment. Let's do our part to keep New Haven and surrounding communities clean so we can enjoy cleaner air, better health, and an improved quality of life! •Rock to Rock Earth Day Ride is coming to New Haven on Saturday, April 26th! Enjoy New Haven by bike and raise funds for 20+ local organizations. Register/donate by visiting the Rock to Rock New Haven page. •Carpool with a friend and check out some other Earth Day CT events (courtesy of the Dept. of Energy and Environmental Protection)! •Recycle! Don't let water bottles become landfill. Dispose of them in blue recycling bins for curbside recycling service. For those without curbside service, you may use the Recycling Center located at 260 Middletown Avenue, off I-91 exit 8. •Donate! Before you junk that dinner set or laptop, think about local schools (i.e. St. Martin de Porres Academy) or shelters (i.e. Columbus House) that may be able to put your old material to good use. •Garden! Enjoy pesticide-free, GMO-free fruit and vegetables courtesy of your very own garden! This would be an especially fun project for families with younger kids. •Cut the loops! We've all seen those plastic pieces that hold 6-pack cans togerher, but did you know that they could wrap around an animal's neck? Remember to "cut the loops" and possibly save an animal's life. 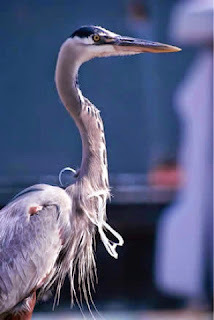 Let's not let any of our Long Island Sound birds end up like this poor little guy pictured below. Cutting the plastic from cans of six-packs can save this guy's life! 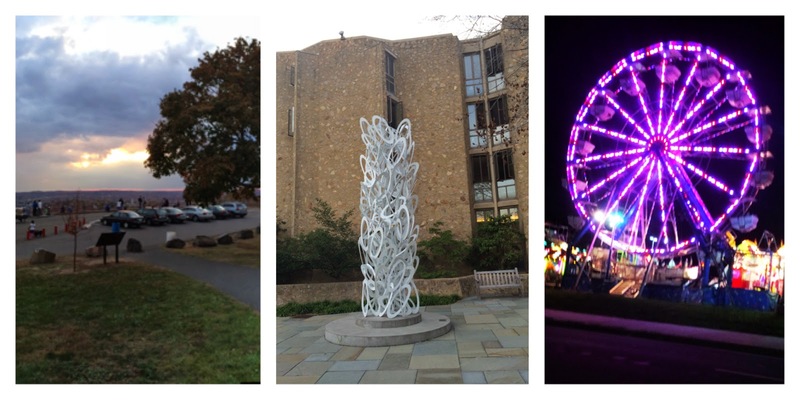 What's Up New Haven: April Showers Prize Pack for Instagrammers! 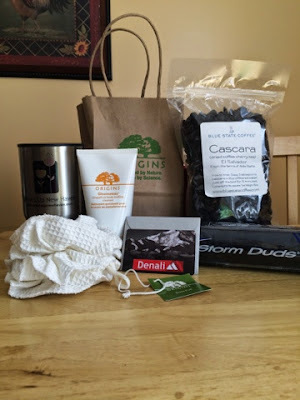 What's Up New Haven "April Showers" Prize Pack! Even though April is off to a sunny, 50-degree start, let's not forget that yesterday we had SNOW showers in New Haven! This prize pack was crafted with the hopes of getting you through a damp, gloomy April. All items (except coffee mug) were purchased at The Shops at Yale. Origins Gloomaway Body-Buffing Cleanser and Loofah: This grapefruit-scented body wash and beautifully textured puff will leave you feeling happy and clean -- even on Elm City's grossest of days! Blue State Coffee Cascara Dried Coffee Cherry Tea: This bold tea from El Salvador is a great brew to keep you warm and to give your body that needed boost during the day! Campus Customs Storm Duds Mini Umbrella: Whether its your first Yale accessory or your 40th, we really are in "Yale Haven". Let's celebrate it! What's Up New Haven Coffee Mug: This stainless steel mug would pair beautifully with that Cascara tea! Just throwing that out there. Remember: This giveaway is for Instagram members, so make sure you have an account! Post a picture of your favorite New Haven hangout to Instagram. Make sure to hashtag #whatsupnewhaven or tag @whatsupnewhaven in the caption!! This is how I will find your submission, and this will automatically enter you into the drawing. Winner will be announced on April 15th! Reach Your Fitness Goals with BEyond FITness! We're off to a snowy day (!!) but believe it or not, summer is soon approaching. Are you ready to shed that cardigan? Not so much? No worries. The BEyond FITness staff is on-hand to help you achieve your fitness goals before temperatures start to sizzle! 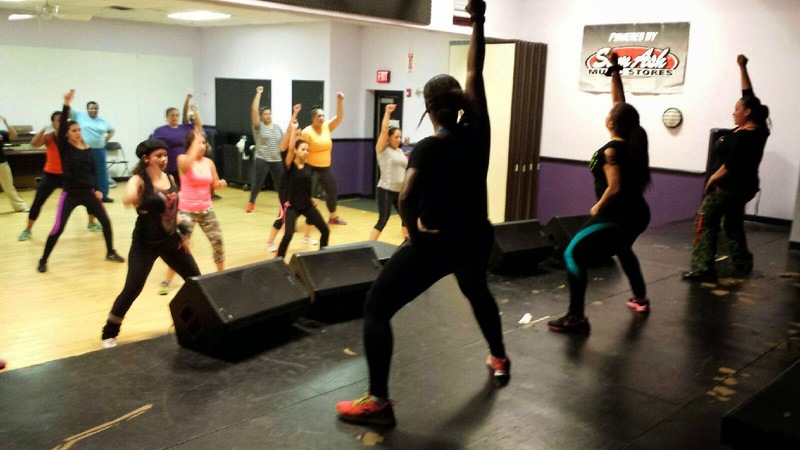 Zumba® Fitness instructors (L-R) LaTanya Elliott, Ivette Altieri (Owner) and Naty Arango. BEyond FITness is a community-based company, dedicated to providing a unique experience at facilities, schools and events. People of all levels are encouraged to try a class. 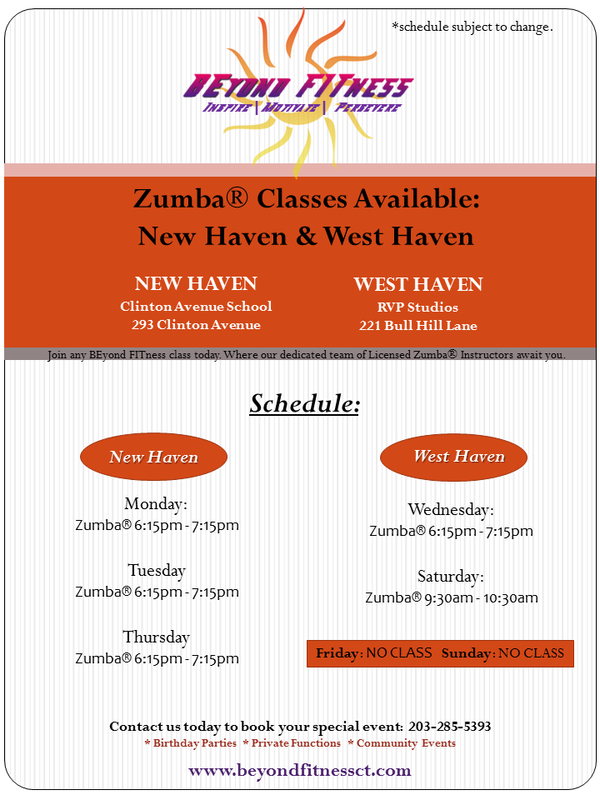 At the moment, BEyond FITness offers Zumba® classes 5 days a week at 2 locations in New Haven County (see schedule below). BEyond FITness staff includes Ivette Altieri (Owner), LaTanya Elliott and Naty Arango. These ladies bring the heat every class! Whether you're new to Zumba or an old pro, you will find yourself grooving -- and burning off some serious calories -- to music from around the world! Find them on Facebook for class updates and events. Drop-ins are just $5, and membership prices are reasonable if you feel you'll be a repeat customer. Spoiler alert: You will be a repeat customer! Helpful hint: Are you on a tight budget? Want to try a class without the financial commitment? Drop in for Appreciation Tuesdays! Tomorrow and every Tuesday, you can get your dance on for FREE. Bring a water, maybe a towel, and a good attitude. You won't regret it! Not long ago, the term "gastropub" did not exist in my vocabulary. Pop culture is forever evolving, and as we enter the age of #twerking and #selfies (okay, perhaps "evolving" was the wrong word), we happily welcome local gastropubs into our every day mix. Gastropubs are pubs that specialize in serving high quality food. If you're tired of noshing on your typical bar food at happy hour, New Haven offers three gastropubs that you don't want to miss! You may know it as the old Humphrey's or Carissa's Cafe, and now Madden's brings a friendly, laid-back venue to Humphrey Street. My friends and I stumbled upon Madden's last July when they first opened. We had just done a performance in Jocelyn Square and were on the hunt for a nice lunch spot. Even though we were newcomers -- and sweaty newcomers at that -- they still welcomed us and served some amazing drinks and appetizers. I am excited for the cucumber and watermelon drink to come back in season again! Madden's has a handful of televisions that are usually tuned into sports, and the clientele is a mix of people from the surrounding East Rock neighborhood and local graduate students. They offer a private parking lot, live music nights, and a place where you can relax and laugh with friends or a date over a delicious meal. Can't beat that! 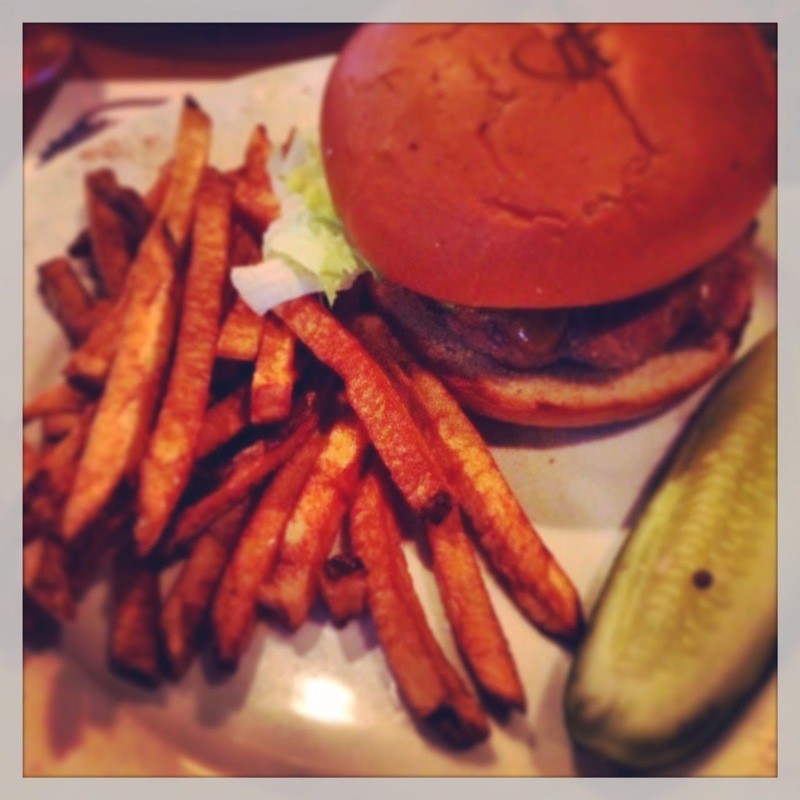 Turkey burger and seasoned fries from Madden's Gastropub. Mmm! I learned about Oak Haven driving down State Street, and then I found the encouragement to visit through a Groupon deal. Now that I've tried it, I'm so happy that I got to experience the greatness and wish I had actually started going there sooner! Oak Haven is a farm to table restaurant so get ready for some high-quality, fresh food. Also, the meals are served tapas style so be sure to share with your friends! Tapas! 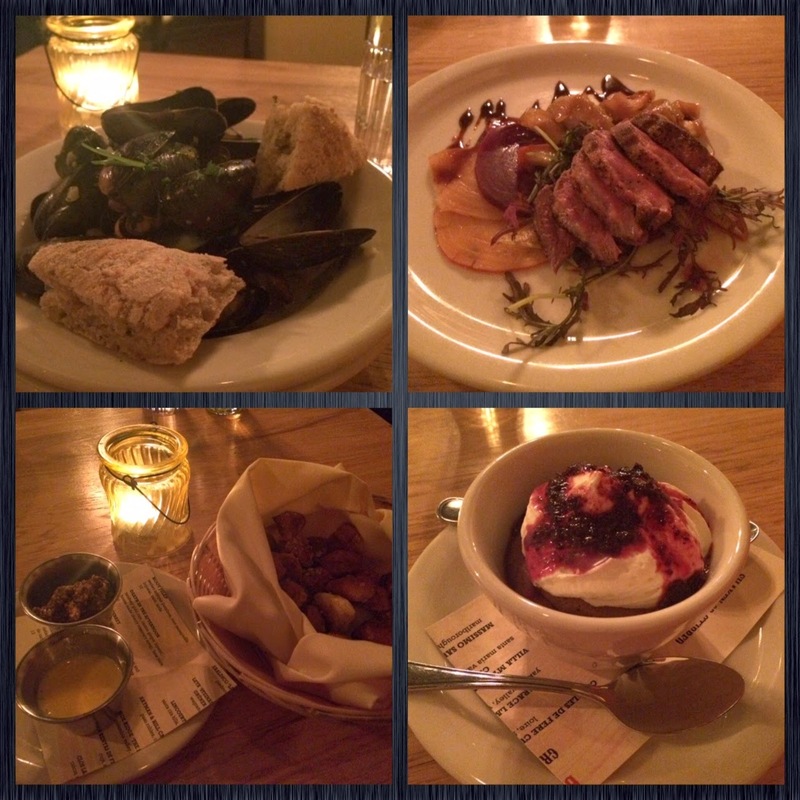 Enjoy mussels, duck w/beet salad, pretzel bites and chocolate mousse at Oak Haven Table & Bar. The time I went was a bone-chilling day below freezing, but I look forward to coming back when the weather is nicer. The waitress told me they open the doors in the front which leads to a little patio with some outdoor seating. I imagine it would look resemble a mini Manhattan on a nice, summer day! Looking forward to that experience. 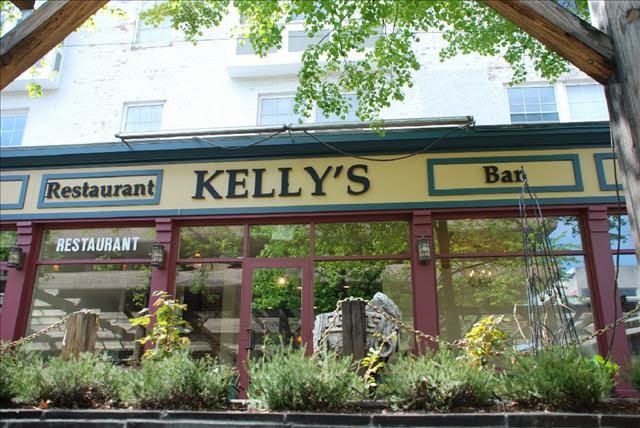 Kelly's Gastropub in New Haven, at Crown and Temple Streets! You just never know when a blog post idea is going to hit you! As I was driving down Whitney Avenue toward Hamden, there was a colorful, happy looking truck headed the opposite direction that caught my eye. As I was driving, the name "Vito's Mobile Art Mart" had me intrigued. I wondered what exactly is a Mobile Art Mart? In my head, it was a mix of the Big Green Truck and The Clay Date. 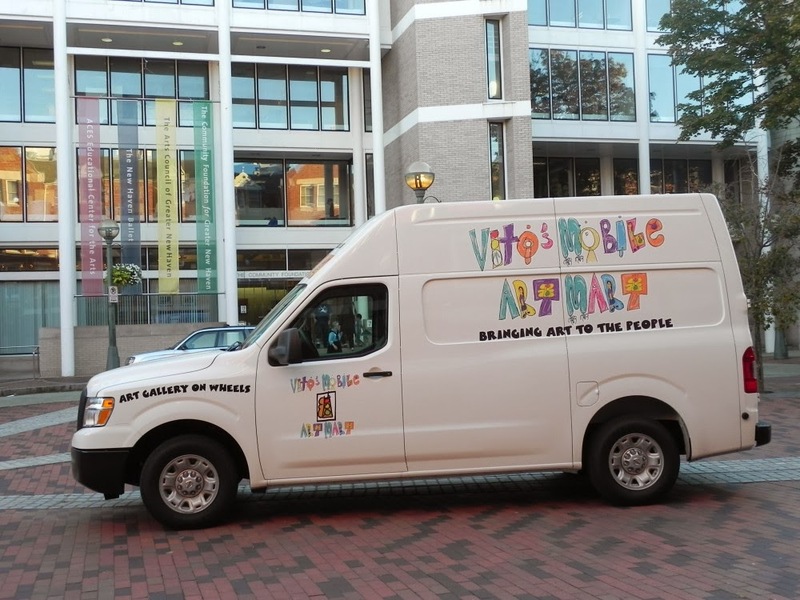 Curiosity had me to the point that I did a Google search on the name and found that this was a truck for local artist Vito Bonanno's mobile art gallery. You can learn quite a bit about Vito on his portfolio website. From his biography, I learned that he was diagnosed with PDD/Autism at a young age and uses art as a form of release from his disability. I have yet to meet Vito Bonanno, but I'd love to see his artwork featured around New Haven. I was intrigued by his truck and awestruck by his story. Wishing Vito the best of luck in his artwork and beyond! Want to help our community get healthy? 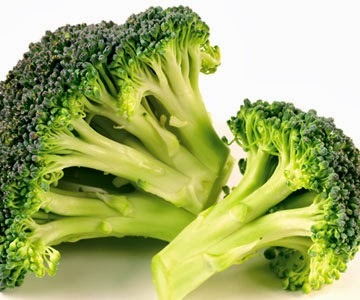 You can drop What's Up New Haven a comment, Facebook post, or tweet with your favorite broccoli recipe. Happy dining!